If you’re like the large majority of people spending a great deal of time on social media platforms such as Twitter and Facebook, why not consider using them as an advertising tool for your business as well? Digital platforms like Twitter and Facebook make tailoring your advertising content to a specific audience easy and direct. The key is in knowing how to customize your advertising to find just the right people that are going to engage and be interested in your content. By learning a few simple techniques, you can pinpoint the exact audience you need to get your message in front of the people who are most likely to make a buying decision for the products or services that you’re offering. 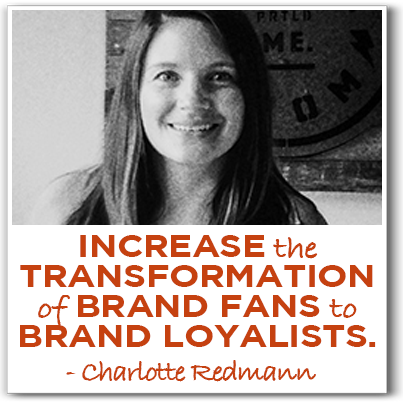 Charlotte Redmann helps savvy brand managers expand their marketing efforts using her vast skills and experience in social media and digital marketing. Charlotte was the first person hired to the internal digital media team at Beam Suntory, and led the digital efforts for Pinnacle Vodka, Skinnygirl Cocktails and Cruzan Rum. Rich: Initially drawn to the bright lights and buzz of the big city, Charlotte Redmann recently returned to her native Maine, where I am right now. While in Chicago she honed her social media and digital marketing skills at Beam Suntory, the second largest spirits manufacturer in the world, with more than 100 brands. Charlotte was the first person hired to the internal digital marketing team and led the digital efforts for Pinnacle Vodka, Skinnygirl Cocktails and Cruzan Rum. Yes, she was paid to drink and tweet about it. I do it for free. Now back home in Maine, she’s found her way to Blaze, a local company that guides business growth. She brings a global perspective on social media marketing that she distills down (no pun intended) in creating effective social media programs for a growing number of clients. Charlotte, welcome to the show. Charlotte: Thanks for having me. Rich: Now listen, you come from a background of running digital efforts for a lot of big brands. How did you arrive there? What were the steps to ending up in Chicago? Charlotte: Bright lights brought me there, I think, first of all. I was originally working here in Maine in a small company called White Rock Distilleries, and part of a 7 person marketing team there. Eight months in I was on a phone call with the whole company and learned that Beam Suntory had purchased Calico Jack Rum and also Pinnacle Vodka. So I took the opportunity to ship out for a few years and get a taste of the big city life, and now back in Maine while I continue working in the digital realm of things. Rich: Well, welcome back. Now many small businesses were initially attracted to social media mainly because of this perception that it’s all free. But you and I had the conversation before we got on the phone today and you’re suggesting that we pay for social. Social advertising and digital ads. Now I’m sure many entrepreneurs and many marketers would say, “Why should I pay for this when it’s free?” What would you say to those people? Charlotte: It’s a really good point and I think starting off social was such a way to make the world more open for businesses and people alike. And since all these platforms have opened up and have opportunities to pay for marketing, obviously more brands have jumped in on that, and it’s made it a little tough for us to get our organic reach out there. So we all know that organic reach is declining, and as users and networks continue to grow our platforms attempt to monetize the actual product and it becomes tougher to reach the fans and followers organically. So I would say paid offerings have been made to counteract that. Just for an example with Facebook, if you have 100 fans you’re only going to reach 10 of them at one time, because you reach less than 1% of the actual followers that you have. So using one of the ad platforms on Facebook, you can actually reach and target just your fans at a lower cost per click rate. So you’re still going to be reaching your fans even though organically they won’t be able to really see the content that comes through because it is such a crowded place now. Rich: And I think that’s what people have to just kind of accept is that a few years ago it was exciting and new to be on social media, and so the early adopters did have that opportunity. But as people saw the success of social media marketing, it became more crowded. And as it became more crowded – like any marketplace – the rents are going to go up. Charlotte: Exactly, that’s a perfect way to put it. And now there are so many options for paying to use on social and you just have to pretty much choose your objective, whether it’s to get people to look at your website, to get them to engage with you, to get awareness up, there are all different types that you can choose from and you don’t have to have a major budget to do this. Before when you would post – specifically talking about Facebook – you would reach everyone that was your follower. Now, probably the #1 reason I would recommend using paid search is that there’s an incredibly large reach with an unmatched accuracy. So you can go on and reach the right consumers with a tailored message to that specific audience. Rich: And I definitely want to talk to you more about targeting, I think that’s really exciting. Let’s just take a step back because you also mentioned something that I think is important, which are goals. I talk to a lot of people and I’m like, “So, are you doing anything in digital ads?” And they’re like, “Oh yeah, I’ve got Facebook up and I’m getting a lot of ‘likes’, I’m paying for ‘likes’.” Which is to me right now – and I’d love you to correct me if I’m wrong – it just doesn’t feel like that’s where I want to spend my money if I’m just paying for the opportunity to reach 1/10th of the people that I’m buying the rights to reach on a regular basis. So when we’re sitting down, as a small business with limited funds, how would you recommend that we think about what our goals are and what we want to accomplish when it comes to spending money on advertising? Charlotte: Well, I think it goes back to your actual entire marketing strategy. What is the reason that you’re marketing in the first place? If it is awareness, if it is to get people to click through your website and install an application – whatever that may be – that should be the objective that you’re using to market on social, as well. And while there isn’t sort of a return on investment as a monetary metric, there is a return on engagement. Which overall increases your brand’s strength that will then be able to help you indicate your success. So you kind of measure the longer the time that the consumers interact with you, you measure by brand loyalty. We all know that the marketing efforts are usually aimed at increasing the transformation of your brand fans to brand loyalists, and they in turn use word of mouth to talk about your brand for you. So just thinking differently in the way that you’re measuring, but keeping the strategy at the beginning the same as that. Social should just be another key player in your marketing mix. Rich: Yeah. I think the important takeaway there is, with your goals you do need to figure out what you’re trying to accomplish at the beginning before you start spending any money. If it’s brand awareness, that’s great. Now for me, as a small business, I would love if everybody’s talking about The Marketing Agents or flyte new media or Agents Of Change, I don’t think that’s going to happen very often. So for me, when I sit down to figure out my goals, I’m looking for email signups, webinar registrations or filling out my contact form because I drove traffic to my website. Of course every business and entrepreneur is going to need to figure that out for themselves, but I do think your point is well taken that you need to figure out what your aiming for before you actually pull that bow. Now if we are going to invest in social ads, where have you seen success? What platforms or what approaches have you seen work? Charlotte: I think the best example that I have used personally is Facebook. I worked on a campaign that was called “A reach in frequency” campaign, so the example I’m going to pull from is with Pinnacle vodka. Although that company had a bigger budget, a lot of the learning from that you can pull from. So the example is that we made some videos to tell people how to mix this vodka. We noticed that a lot of people were kind of searching and researching for ways to use the one out of 40 flavors that we had. So we used the “reach in frequency” model that was great at aiming for general awareness because you can guarantee that a certain percentage of the target is going to be reached. You can also – depending on the reach and impression threshold – we can include a Nielsen benefect study which shows in terms of sort of validating impressions that were served were to the right people and it changed their mind to do something. So we targeted women from 30 to 40 on Facebook that saw that ad within 30 days, and we drove 45 million impressions that month and 83% of all those impressions were on mobile devices. You can figure out how many times that you want that ad served, so we had an average of 3.15 times, and we saw personally a 5 point lift in purchase intent, which is really, really large. And that goes back to measuring. It’s how do you talk the decision makers of companies into investing into social? And it’s those returns on engagement that help tell that story. Rich: That’s pretty interesting. Now, I’m just kind of curious, what did the ads look like? Did the ads include the video or were the ads up there to drive traffic to a video, how did you set that all up? Charlotte: We were lucky enough to have a really robust plan around each piece of content. So we had a video for each and we also had still images for each. So the reacher frequency was actually done with a still image, but we did 18 different segments for this. One, for example – because you can target people so well on Facebook – we targeted people who had just gotten engaged or just got married and fed them some content on a cocktail to make to celebrate that. And that just goes to show how far you can really get with your targeting. Rich: Absolutely. I’m just wondering if you could target people based on their football allegiance, then all of a sudden you would be saying, “Hey, here’s a celebratory drink for everybody in New England right after the Superbowl, or a conciliatory drink for everybody in Seattle” – or probably the rest of the country since everybody hates the Patriots. Because you could definitely target by geography. Charlotte: Absolutely, yeah, You can do it by geography, you can do it by other interests or other pages that they liked on Facebook. Unfortunately, you have to call it “the big game” because it’s trademarked, you can’t really say “Superbowl” and use it in advertising. Rich: So the targeting is obviously really interesting. Have you learned anything through using Facebook targeting to identify these different audiences? I mean, obviously you were playing with a bigger budget, but you’re still doing the same thing that small businesses need to do which is get you message in front of somebody who is likely to make a buying decision. Charlotte: Yeah. I think it goes back to what your objective is. Obviously you only want people that are going to engage and be interested in your content to see it. You’re going to get a better conversion rate there. So another example we did was a birthday cake cocktail. We actually targeted people that had a birthday within that week, and showed them this birthday cake cocktail to make. So its making sure that it’s very timely and relevant to that person that’s going to see it to really make sure that it doesn’t look out of place in their newsfeed. Rich: So make the advertising as native as possible so it feels like part of the Facebook landscape. Charlotte: Yeah. And the nice thing about Facebook is that there are so many ways to target that you can make different content to fit different targets. Rich: How do you mean? Charlotte: Well, if you’re a basketball sports company, you can target a piece of content to people that are interested in basketball. So it doesn’t necessarily mean that everybody is seeing the same thing. Rich: Ok, that makes a lot of sense. So you’ve got whatever your product is, you may be able to slice it and dice it. If you’ve got 10 different audiences there you can actually show them different advertisements based on things that they’ve already liked or engaged with on Facebook. Charlotte: Exactly. And it goes to show the actual agility of this ad platform and that launch times are almost instantaneous and it allows you to test content at scale and real time. So if you see something that within 24 hours isn’t getting that much interest, you can pull it and finagle it to be something different and then test it again and keep going back and forth that way so you can optimize it yourself and control the content that it going out. Rich: That’s pretty cool. Now, when you were over back in your old company – or even now – we’ve talked a lot about Facebook, did you do anything with the Twitter ad platform? Charlotte: Yeah, we did. And I think Twitter has definitely come a long way in the past year or so just piggybacking on what they’re seeing Facebook doing. Some of the Twitter ad platforms that I’ve used are the promoted trends, that’s like the mack daddy of them all, that’s big bucks because they’re only 1 a day for 24 hours. Rich: Right, that’s like tens or hundreds of dollars, right? Charlotte: It is a lot. And I obviously don’t necessarily believe in promoted trends, because it’s supposed to trend organically. If you’re paying for a trend, it’s not necessarily a trend, because you’re paying people to talk about it. But the other ones are the promoted tweets, which leverage your tweets to ensure a higher percentage of followers are going to see it. And then also a promoted account, so it shows up on the side of your feed judging by who you already follow that you might also be interested in this company. Rich: Right. And so from a targeting standpoint it seems like Facebook knows everything about us, Twitter only knows what we complain about online – that’s a little bit of a joke. What level of targeting do we have on Twitter compared to Facebook? Charlotte: It’s not quite as diverse but we can target by device, which is helpful because we’re seeing obviously most people are looking at Twitter being mobile. You can geo-target, you can target by gender and you can also target with interests. Rich: And by interests, if I want to get in front of people that like golf, I can be targeting people who like golf, who have tweeted about it, who follow other people who talk a lot about golf. Is that what you’re suggesting? Rich: I know that Twitter advertising is a lot less expensive these days, Facebook advertising has gotten a lot more expensive in the last year or so. Is Twitter still pretty inexpensive for ad buy? Charlotte: Yeah, you can still do something with a minimal budget there, and it also goes by cost per engagement, so you’re really paying for what you get, per se. So you’re not just paying to be seen, people are actually doing something with that you’re showing them. So again, you can go back and look at the metrics on it and really justify what you’re spending. Rich: I’ve been playing around the last couple weeks with Twitter advertising and I do think that the costs are very low right now for acquisitions. I think it’s probably going to get more crowded as people get more used to using that platform, maybe moving away from Facebook. So I think it’s a great opportunity now for entrepreneurs and small businesses to take chance on this and just experiment a little bit. Now if we get into experimenting and trying some things – you’ve already had a little bit of a track record here – do you have some best practices, do’s and don’ts, that we should consider as we’re getting into digital advertising? Charlotte: Yeah. One big one is always speak in the brand voice and use imagery – especially on Facebook – there’s a 20% rule, so you have to have less than 20% of your actual ad be copy, so I think that’s one. Also always consider how the image will be displayed on your phone as well as on your desktop as well as on a tablet. Always keep it simple, it should fit in with the other content that you see in the feeds. And don’t drive people off site. So if you’re advertising on Twitter, don’t make them click on something to leave Twitter, they’re on there for a reason and going through really quickly, you only have a few seconds to get your point across so you’re going to lessen that engagement by trying to get them off of there. Rich: Alright, well, you and I are going to disagree on this point. I know that people always used to say they never want to leave Facebook, don’t ask them to leave Facebook and they came up with all those custom tabs and everything like that. And you know, you may be right, you’re smarter than me. But I’m just saying I’m a small business owner and my ultimate goal is to drive people to my website. I understand that with Pinnacle vodka we’re coming from a different thing, but do people really get upset when you give them a big enough reason to leave Twitter for a few minutes to sign them up for a webinar or to download an app or something like that? I mean, if I’m downloading an app – which I know is one of the Twitter ad platforms – aren’t I forced to leave the app to do that? Charlotte: I think it differs by platform. I think people are more used to that on Facebook, on leaving Facebook to get the top 5 cat memes of 2015 or whatever. But on Twitter, I still feel that it’s such a fast, quick moving, little tidbits of news. If there is such a compelling reason to get off, then yes. But just for Twitter, I think it’s a different model than for Facebook, I think people are more comfortable staying on Twitter. Rich: Let’s say if I decide today that I want to get started and try something, what would you say the very first thing I should do is? If I just want to get started on advertising, I listen to this podcast and I realized that I need to raise my profile or get more ‘likes’ or drive more traffic. How would you suggest somebody take that first step? Charlotte: I would take a look at your criteria for being on the social channel that you’re on, and where your biggest following may be and where you can make the biggest impact. And then I would suggest trying Facebook and Twitter first, which are the easiest ones to get going on and the ones everyone is used to seeing ads on. then come up with a couple of different pieces of content and a couple different metrics that you want to measure and kind of just stick them out there with a few dollars behind each one and just see how they do. In a couple days or a week or so take a look at that, and the best performing one is the one that you know works and then you can prop it up a little bit. Rich: That’s awesome. So from what I heard you say today is to start with your business goals and make sure that whatever advertisements you’re going to run is in line with those. Then create the ads, and visual is very important, especially on facebook. Target your audience, make sure that you know who your ideal customer is and then use the different tools on Facebook ads and Twitter ads to make sure that you get in front of those people. And finally, measure, measure, measure to continually improve your own investment. Charlotte: Yup. Sounds like I was making pretty good sense there. Rich: Awesome! Charlotte, if people want to dig a little bit deeper and learn a little bit more about you and Blaze, where can we send them? Charlotte: Head on over to Twitter and follow us at @MaineBlaze. My personal Twitter handle is @SocialChar and also check us out at FollowBlaze.com. Rich: That’s awesome. And for those of you in the other 49 states, that’s Maine – the state of Maine – with an “e” at the end of it. But don’t worry about it, we’ve got the show notes with all the proper links, they’ll be posted along with this podcast and the full transcription and all of the awesome stuff that Charlotte shared with us. Charlotte, thank you very much for your time today. Save over 50% on the Virtual Pass for Social Media Marketing World AND get a Digital Pass to AOC2015 for free! Learn more about Blaze, where Charlotte helps businesses with their strategy, branding and advertising. You can also follow Blaze on Twitter. flyte new media – where Rich spends his days crafting clever tweets, googling cat memes and strategizing ways to take over the world with his Agents of Change Digital Marketing Conference and The Marketing Agents Podcast. 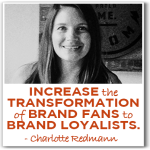 This entry was posted in Content Marketing, Online Advertising and tagged Advertising Tools, charlotte redmann, Maine Blaze by Rich Brooks. Bookmark the permalink. Glad you enjoyed it, Gates!